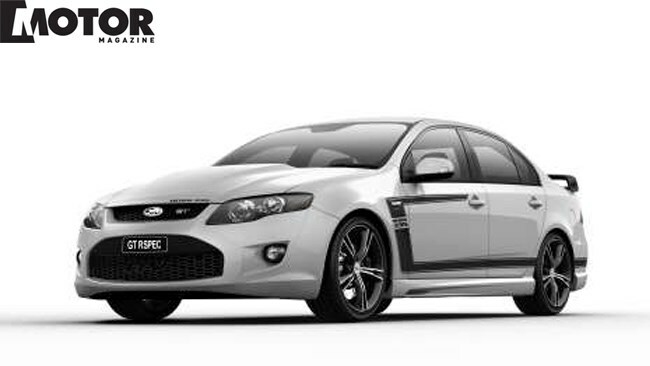 As previewed by MOTOR in its September 2012 issue, Ford Performance Vehicles (FPV) has launched what it claims is the most 'hard-core' Falcon-based GT ever, with the release of the new GT RSPEC. Limited to 350 examples, FPV says the new edition has been developed to answer criticisms levelled at the dynamics of its performance flagship in recent years. Suspension tuning and a wider wheel/tyre package are aimed at translating the GT's (unchanged) 335kW/570Nm into more tenacious step-off traction and cornering grip. The product of an 18-month development program, the GT RSPEC features revised suspension, wider nine inch rear wheels with 275/35 R19 Dunlop Sports Maxx tyres and, in first for FPV, launch control. The rear suspension set-up boasts higher spring rates, re-tuned dampers, a fatter anti-roll bar, and reinforced rear lower control arms. At the front there are stiffer upper control arm bushes, stiffer front upper suspension strut mounts, and recalibrated dampers. Extra rubber will provide a much-needed traction improvement during launch, and in cornering, while a revised toe setting on the rear wheel alignment also gives improved turn-in response. Stiffer transmission mounts reduce powertrain and driveline movement under load for improved ride quality, and FPV Managing Director, Bryan Mears claims the GT RSPEC is "the finest-handling GT in history." The addition of launch control is designed to deliver more consistent performance when accelerating from rest. Expect 0-100km/h in the high four second bracket, and the standing 400-metres in around 12.8sec. Visually, the RSPEC's distinctive stripe and paint package is reminiscent of the iconic 1969 Boss Mustang and its modern day successor. It is available in four colour combinations, 175 units committed to the 'hero' scheme of black with red accents. The remaining 175 cars will be made up of white, red and blue with black graphics. Inside, leather sports seats, complete with GT logo, are matched with a piano black finish around the dash and console. Recommended list price for the GT RSPEC is $76 990.